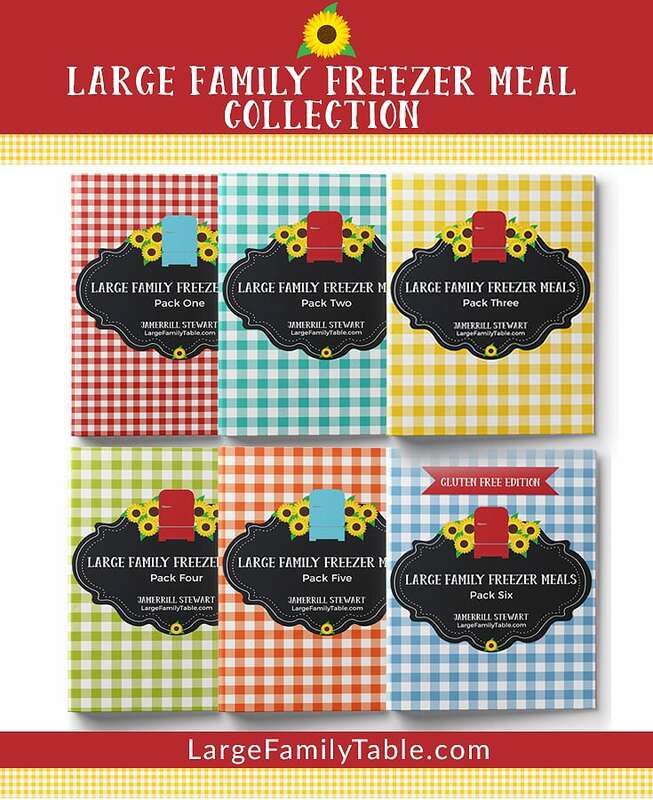 In my recent large family freezer cooking day two, I prepared five easy lasagna freezer meals. Just slide one or two pans into the oven and serve with salad, buttered green beans, and bread. 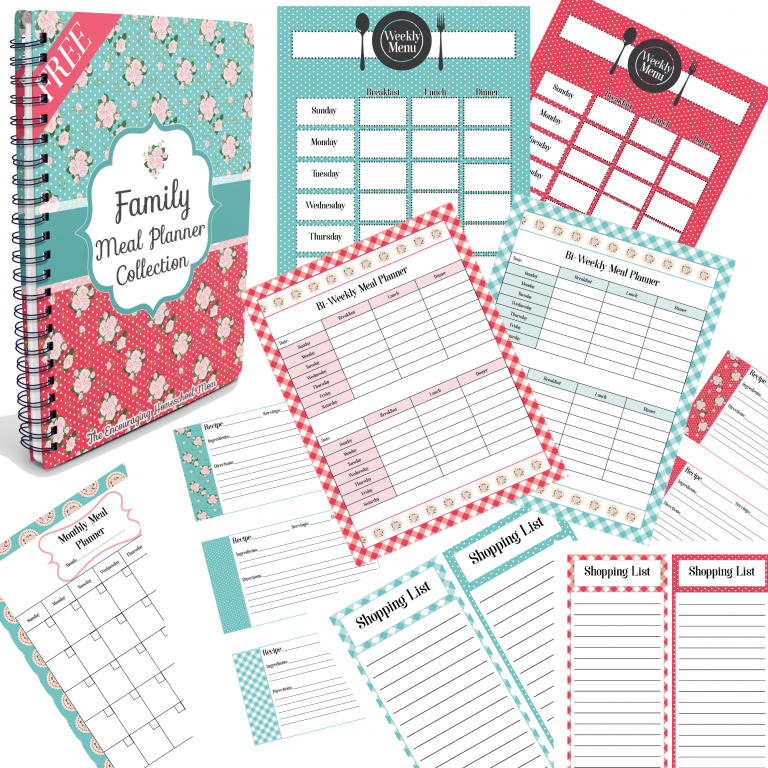 One 9×13 pan will feed my family of nine of various ages and stages for one dinner if a few easy sides are added. When I want leftovers, or we’re feeding more people I bake two pans. 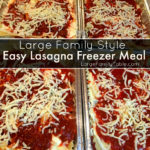 Homemade lasagna is an easy and frugal meal. You can cut back the amount of ground beef you use in the recipe, and it will still be divine. You can also substitute cottage cheese for ricotta cheese if needed. You also do not necessarily need to precook your noodles. Most times your dry noodles will cook well if they are covered with plenty of sauce while your lasagna bakes. I did precook my noodles ahead this go round because I was already doing so much cooking. Do what works for you! 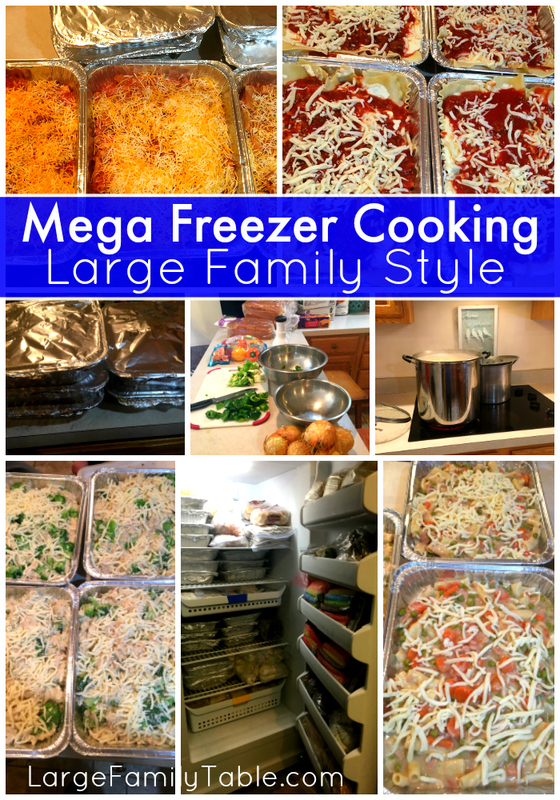 This Lasagna Freezer Meal Recipe yields 4-5 9×13 pans. I also had enough meat sauce and cheese sauce left to make 4 pans of my Baked Ziti Freezer Meal. You can always throw extra meat sauce in a gallon freezer bag to have sauce quickly available for additional meals or make an extra pan or two of lasagna if desired. 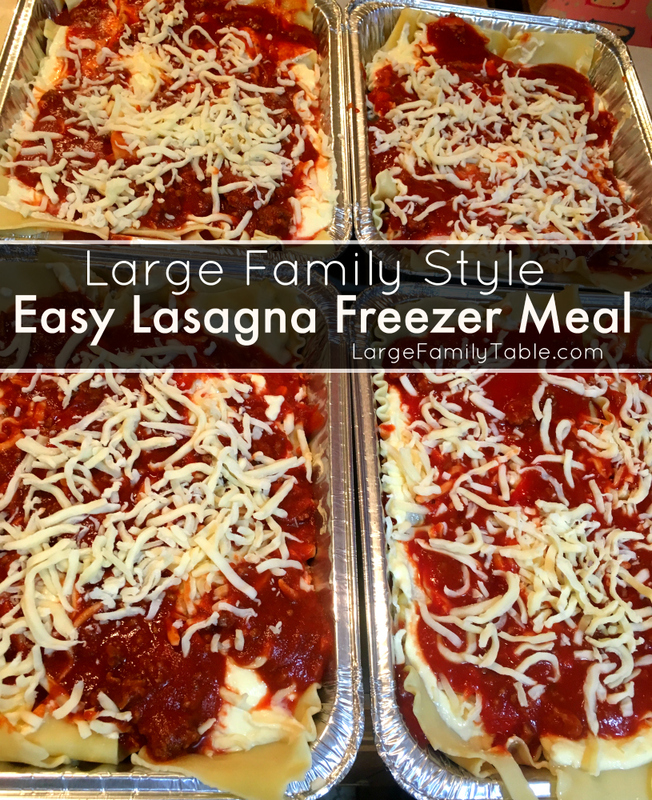 Enjoy this lasagna freezer meal recipe that easily feeds a large family! Precook and drain 5 lbs of ground beef. Combine 5 lbs of ground beef with two large 105 oz cans of plain tomato sauce in a large stock pot. Add in 4 oz of garlic powder and 4 oz of ground oregano. In large mixing bowl combined 4-32 oz tubs of Ricotta Cheese, 12 eggs, and 2 cups of mozzarella cheese. Mix well with hand mixer. After draining noodles rinse with cool water to prevent further cooking. Set out 5 9×13 baking pans. Add enough homemade meat sauce to each pan to cover bottom on pan. Layer cooked lasagna noodles over sauce in each pan. Add layer of homemade cheese sauce to cover first layer of noodles in each pan. If available sprinkle layer with an additional 1 cups of shredded cheese (will still come out wonderful without the additional cheese if you don’t have on hand). Continue to repeat layers of meat sauce, noodles, and cheese sauce until you are near the top of your pan. Add final topping of meat sauce and 1 final cup of cheese. Set the desired pans of lasagna out in the refrigerator the evening before you’d like to serve them. Preheat your oven to 375 (oven times may very). Place in preheated oven for 1 hour or until bubbly and hot. Remove layer of foil and allow to cook for 10 additional minutes. Allow your hot lasagnas to slightly cool on counter for 5-10 minutes before serving. If cooking your lasagna from completely frozen (this happens in real life :), remove plastic wrap and one layer of foil and place frozen lasagna in preheated oven at 400 (oven temps may very). Cook for up to 2 to 2 1/2 hours or until hot and bubbly. Remove foil and cook uncovered an additional 10 minutes as needed.